I know I am slacking, but here's another post for Every Day in May. I wrote this in a cabin on a mountain, listening to the rain gush from overflowing clouds. "So, who will go to Africa this summer?" The blood pumping inside my veins forgot its course and all rushed instead to my nodding head. "Yes," I was saying with the almost hypnotic up-and-down-motion, "Yes, I will go to Africa this summer." I walked up with a mass of young, eager-to-change-the-world collegiate types and we all affirmed one another's calling to serve in Swaziland the following July. I left the meeting exhilarated and ready to tackle the problem of practicalities. I called my parents and my joy bubbled over into our phone conversation, only tempered by their advice to pray and be cautious. Days went by and the emotions wore off. Both gradually and suddenly as I prayed, I knew I would not be going to Africa and I then met a fierce dragon called doubt. If the Lord hadn't told me to go to Africa, then who? If I was pursuing the Lord then why the mixed signals? Was I so far from God that I couldn't even discern His calling? "Sometimes, Caroline... sometimes God just wants to bring us to the point where we say we are willing. Whether you go or not doesn't matter as much as how ready your heart is to do whatever the Lord asks. You were willing to go and God saw your heart." I rolled those words over in my mind for days, really hoping they were true. I questioned and wrestled and arrived at the conclusion that our pursuit of God is not dependent on His answers. My pursuit of God is not on pause when I receive an affirmative or in high speed when I'm waiting for a reply. God calls me to a constant, passionate pursuit of Himself and promises (regardless of my progress) He will be faithful and He will be sufficient. As Isaiah, I hope I will respond to every call with, "Here am I. Send me." Even if the call doesn't amount to the movement of my feet, I pray I will be willing. "not always, but sometimes...the thing you wanted the most is the thing that you now want the least." Lucy tugged at the corduroy strap of her pink overalls and listened to the soft crunch of forest beneath her feet. The morning scene drifted in and out of sight, while she tried to focus on the sporadic groupings of trees and the unmarked path winding in front of her. Freedom fell on her lips in the misty haze cloaking the friendly trees... and she breathed. She welcomed the familiar motion in her chest - rising ever-so-slightly while the pure oxygen gathered in her belly. This place was a sanctuary, an escape, a shelter, and a friend. It was strange to feel as if she'd just walked into her home, kicked off her shoes, and cuddled up in the overstuffed sofa. Physically, she was far from the place where her presence was expected to emerge upon sunrise. But, Lucy's heart lept at the joy of this new place. Every single bristling green leaf responded to her deep breaths, moving with the slight motion of her chest. The energy was almost electric around her, though Lucy's relief at the lack of electric current was obvious. She let her hands drop to her sides, smoothing the corduroy pattern and testing the silence. With a slight shoulder shrug, which seemed to say to the trees, "you're my new friends, right?" Lucy slowly stretched her arms up, up, up into the air as far as her little frame could manage. When they reached the highest height, her mouth opened and an unplanned yelp escaped. Startled, Lucy turned around (with arms still extended to the highest height) in a small circle and waited to see if there would be a protest. Sensing none, Lucy's eyes relaxed and this time the yelp was every bit planned. In fact, it turned into a joyful song and dance, with complete abandon to the freedom of the place. Moments or minutes later (Lucy's joy did not let her keep track of time), Lucy wandered over to a stunning green shoot, growing from a fallen tree. The colors seem magical almost, or painted. Afraid to touch it, she got real close and smelled its smell. Wet, dirt, clean, and earth filled her nose. Her pause was altogether too long, but now Lucy knew she could linger without worrying. She stared at the little green shoot sprouting from the fallen tree until her eyes started to blur and her limbs began to droop. Lucy felt the soft bark underneath her fingers and slowly laid her head down for a moment. Her legs still limp, she let them hang over the edge and float in the forest air. She slept. A faint tickle traced her right knuckle and Lucy roused with half-open eyes to examine the cause. A caterpillar was making its merry way up, over, and around her in search of something, it seemed. Her eyes spread wider and accustomed to the forest light. In the hours that past between the abandoned dance and waking from the most restful nap, Lucy thought the clusters of trees might have changed. The dampness soaked into her and the full shade above her kept the leaves from glistening. She remembered the joyful dance before her nap and wondered if she could muster the same song. The morning scene that started this whole excursion seemed so long ago. My friend Nicole inspired me to write this little piece that I'm quite sure is only the beginning. I still haven't decided how old to make Lucy, but I already know I love her dearly. For now, it is called, "Is this freedom?" "sadness reveals the depth of our love"
I spoke these words today at the airport, as I put my friend Heather on a plane bound for Canada. Her kindness has touched so many lives and one of the students at the airport was taking her departure kind of rough. I leaned over and said this bit about sadness and she just looked at my blurry-eyed. I thought more about it today... about goodbyes and hellos and departures. I'm still not sure if it makes any sense, but my heart seems to understand the reasoning. God has placed in us the desire to love and be loved because He is Love. When that love inside is stretched, bent, or tested, a certain sadness settles in because the love we can give and receive is not perfect. I don't think goodbyes were part of the Garden of Eden. I don't think tears at the airport was ever part of the perfect plan. Our hearts are stretched when the love planted inside of us rebels against the world its constrained to live in. And then words come out like they did today, reminding me that sadness can be beautiful too... even just that the broken pieces reveal the One who can mend. That is my writing for today. I'm not sure why they say the phrase, "jam-packed," but I'm sure that is exactly what this day was! I woke up super early (after saying goodbye to students at like 11:30 last night) to clean, do laundry, and prepare for cousin ANNA to arrive today. Then Heather and I met up with Jess and Danie for a roommate reunion breakfast, which we left in hot pursuit of the airport, where Anna arrived on a plane full of other well-intentioned, big-hearted people. We went then to Alvin's house (pastor of Manos Extendidas) and from there to the feeding center to love, hug, serve, sing, teach, laugh, and smile with the beautiful kids. We waited out a rain storm before we made our way back down the mountain where we enjoyed some bruschetta at a Honduran hippie coffee shop before going to a free movie sponsored by the European film festival. We were all glad we didn't pay for it, but after we went out for coffee and redeemed the night. Finally, we arrived home and I hope Anna isn't too tucked out! I wanted to share some creative words - a rap I wrote with a student as tribute to Heather who leaves tomorrow. I have struggled, admittedly, with this "Every Day in May" thing while having visitors and entertaining, but can you blame me? Really? I know it's completely cheesy, but Natalie and I are about to sing it tomorrow morning at the airport and I'm sure it'll bring a smile! After a crazy day, an afternoon filled with charades and catch phrase and laughter, and a typically cheesy serenade for the 11th grade girls... Heather and I went for coffee and finally caught up a bit. I chose the Latte Au-Lait, which means I am now WIDE awake and she's zonked out (getting the sleep she needs so we can leave at 5:45 am to lead worship tomorrow at staff devotions). I just want to write something quick tonight... maybe it will turn into a poem, but right now it's just thoughts about pleasure. As I think about the students and this culture and (maybe) popular culture in general, I decide that our greatest sin is pursuing lower pleasures. I know C.S. Lewis probably illustrated this idea more deeply than my brain can think it right now, but still it seemed a mini-revelation tonight. O, that I might be an instrument on which God chooses to boldly play the joyful song of redemption. I'm super tired. But, these two articles have been on my mind, so I'm going to crank out some processing about them and call it my creative writing for tonight. In The Huffington Post, Jon Foreman recently wrote an article and then alerted all his twittlers (tweet followers) about his recent journalistic activity. Like the good twittler I am, I checked it out and found "The Dark Horse: Joan of Arc, Elliot Smith, and me" to be sufficiently thought provoking. Not long after, I read Andrée Seu's article in WORLD magazine after a more dedicated search for her writing. I can't find a twitter account for her ... or other ways to be creepily connected, so I have to do the old-fashioned thing and just search the WORLD website. It led me to a gem titled, "Falling from steadfastness" that has secured a space as one of my tabs ever since. So, how could these two articles possibly intersect? Foreman eases us into a history lesson, via the web mecca of knowledge (Wikipedia) about Joan of Arc's visions as a young girl in an English controlled France. At the age when many young girls are learning to drive a car, Joan of Arc disguised herself as a man, and heroically led the French armies to battle and then victories. Foreman's conclusion: Joan of Arc was only a hero because there was adversity. We see the narrative story all around us, playing out in real-time and real consequences. We are all the underdog against this big, nasty opponent called sin. The odds are stacked entirely in its favor and the most obvious and safe and preserving decision would be to surrender before any battle begins. Foreman is processing what this means for the way we're tempted to see the world through cynicism and bitterness. We're tempted to look at the opponent on the other side of the ring and give up before we begin. But, what better time to display our God-given abilities than in the face of adversity? What is the “error”? It is a slightly skewed view of grace that encourages passivity and discourages a striving for greater faith, since all striving—or any muscular “steadfastness”—is suspected of being works righteousness. Never mind that God says to “grow in grace” (2 Peter 3:18). I read it and moused over to the Jon Foreman tab at the top of my screen and wondered if the articles were working in cahoots. If the error of the wicked is "a slightly skewed view of grace that encouraged passivity and discourages a striving for great faith," then turning back from adversity is not only making a statement about your view of the opponent, but also about your view of grace. There is a “holding on” that must be part of the Christian’s everyday life (Hebrews 3:6,14). “Steadfastness” is not the staunch maintaining of a theological position but something much more personal and difficult: It is fighting for your very life, using every weapon listed in Ephesians 6. These articles of armor were not meant to be admired on a shelf but scuffed up in battle. And so, at 11 pm, I'm not sure if this makes sense at all, but I just mashed two articles together and came up with this: adversity is an opportunity for heroism as much as defeat. But, to even hope for heroism, one must be with a right view of grace and armored up to go into battle. Last Saturday, we ventured up the infamous, cloud forest mountain (noteworthy because of my first failed attempt and following lost-on-mountain-adventure). The quaint little cabins welcomed us in the little town of Rosario after the long hike. I was especially glad to reach our destination because we took students with us. The night was filled with food, conversation, laughter, books, worship, laughter, scorpion spotting, laughter, scorpion killing, worship, and more laughter. Again, I realized how important it is for laughter to be involved in my life! We woke up early and ventured out to see the sun break through the cloudy haze and then spent quiet time, worship time, reading time, and breakfast time. We hiked out Sunday morning and we were "sucking the marrow" right out, as Thoreau suggests. I almost collapsed when I got home, if not for the dark chocolate Heather brought from Canada. I took in a Mars Hill sermon, cleaned a bit, and then we made dinner before going to Micah Project. Whew! So.... I am not making excuses, I just want you all to know that "Every Day in May" took place in my journal for the past two days. Well, that's not entirely true. On Saturday night, Heather and I wrote a song that will never be sung again or written down. I wrote the words as they fell off my lips and I happily considered it my writing for the day. Today... well, I decided to go back to the prompts from creativewritingprompts.com and I landed on number 231 which says, "List the 7 worst things to say to a person who just got dumped." Hm. It's not really my cup 'o tea, but we'll see how it goes. I do like that it is going to be short, because I am WIPED out! Today after school, we met up with Diana and Maria and played some cards in McDonald's... then picked up Sara and made some AMAZING orange, mango, ginger chicken with vegetables over long grain rice. 1. "Oh, don't worry, that girl I saw him with was probably just his sister." 2. "Hey, you'll survive! I mean, I've been dumped many times... and you kind of just get used to it, you know?" 3. "What did you do? I thought you guys had such a good thing!" 4. "I'm sorry. I mean, I can't say I know how you feel, since I got married and everything... but it must be real tough." 5. "I never told you this, but me and him... we, uh, well, we like each other." 6. "I guess God doesn't want you to have a boyfriend." 7. "I wonder what you'll do now..."
Hm. I'm a fan of creative writing prompts, but this was completely and unsatisfactorily uninspiring. Well, I'll just say it was probably inevitable to have a day where I didn't love the prompt, the character, or the process. It happens. I have been struggling these past two days because Heather, my former roommate is here in Honduras visiting. I went from writing fictional short stories to very short poems. But, my commitment was to creative writing every day in May, not lengthy or story or even necessarily good. So, thanks to eHow, I have a haiku to share tonight. I'm not exactly happy with it, but it's 11:46 and I'm tired. I also had a wonderful day and I think I'm frustrated I can't be creative enough right now to explain it. I actually remember very little about haiku poetry, so if you have any brilliant ideas or advice, let me know! day SEVEN of the Every Day in May Project - to write creatively every day in the month of May! Tomorrow, I am hiking La Tigra (the mountaintop/cloud forest) and staying a hostel with Heather, Jess, and some students... where we plan to have amazing deep conversations, beautiful laughter, worship, and lots of love! This post was written yesterday, day SIX, but I didn't have any electricity. This is a fictional story to put human flesh on the boy who gave up his fish and loaves for the five thousand. I completely made up everything, but maybe it will help us see this boy as a person and not just a name in typeface. Enjoy! Theo's eyes refused to open. Sleep had sealed them shut and even the obnoxious chickens in the front yard couldn't rouse him. The scream breezed in and halted right next to his ear drums and seemed to reverberate in between his ears. Theo wrapped the scratchy threads of his blanket closer around him and tried to tune out the sound. In moments like this, Theo downright despised his name for being two syllables. Why couldn't he be like the other kids, who had good-sounding, tongue-twisting names like Abinadab or Bizjothjah or Gath-rimmon. No one ran around screaming out those boys' names. Theo's two-syllable name made the dull, gray morning even less desirable as he swung his bare feet to the cold, dirt floor. He rested his hands on the side of the cot and took a deep breath with half-open eyes and then slid his feet into leather sandals and laced them up his dusty calves. "Yes! I'm here!" Theo grumbled, just as his sister Hannah appeared with mid-screaming mouth in the open doorway. Theo grabbed his satchel and slung it over his shoulder, barely hearing his sister's endless chatter. "...and because of that, I am still not ready to leave to get water for the well and you have to feed the animals because they have been bellowing all morning and you know I also woke up extra early to help Mama because Father set off for the Sea and don't you remember that today you are going to the Sea of Galilee to be with Father? And--"
"Wait, what did you say?" Theo was extremely adept at tuning out his three sisters, but it sometimes kept him from important information, like today. "Did you say I'm to go to the Sea of Galilee to be with Father?" "Yes, Theo, of course! Now, feed the animals so they will quit bellowing and ask Mama to pack your satchel with food for the meal. You don't know how long you will be away today." With that, Hannah smoothed her long mantle and tucked some stray, wind-swept strands into her chocolate braid. Theo, with the news of his day's agenda, startled himself into wakefulness and went about the morning chores all the time thinking about the gathering at the Sea of Galilee. His strong, calloused hands worked the burlap bags easily and before his sister could return to pester him, he had already finished. He rushed back inside, sending a cloud of smoke to cover him head to toe, and went in search of Mama. "Mama! I'm to meet Father today at the gathering over at the Sea of Galilee. What have you to send with me for food? ...But, I must hurry!" Theo had only heard rumors about all the commotion about prophets in the region lately, but he knew enough to know that the gathering at the Sea would be more interesting than a day working at home. A day at home would be filled to the brim with mundane chores and errands and two-syllables screams. "Okay, okay. Calm down, Theo," as she spoke Mama moved toward the kitchen to retrieve two fish from the ice drawer and loaves of barley bread from the pantry. "Take these to your father and bring back a full report. Even if your father doesn't return tonight, I want you to be back before twilight, do you hear?" "Mama, do I really bring fish? I am walking and you know how they will begin to stink on the way!!" Though almost 12, Theo still whined like a small child... especially about fish. "I don't even like fish, Mama!" "These fish are all I have to send, okay? Please, just take them to your father and refresh him with this food and your presence," Mama now wrapped the fish in paper and carefully placed them in Theo's satchel with five barley loaves. Reluctant, Theo resigned to his duty, happy for the reprieve from chores but unsure about the prospect of smelling fish for the two-hour-long journey to the Sea. "Okay, Mama." His hazel cinnamon eyes smiled ever-so-slightly before he turned and started walking along the path. After 15 minutes, Theo quickly realized that walking in the heat of the day was easily as horrible as doing chores at home. He spent the next 15 minutes arguing with himself which he would rather do. The argument ended without conclusion, except that both were undesirable and he had another hour and 30 minutes before he reached his destination. He could feel the sweat pooling on his back underneath his tunic and he shifted uncomfortably. The heat was unbearable. Finally, he came upon the Sea and saw a great crowd assembling at the base of a mountain. He maneuvered his way (the benefits of his still-small frame) through the people to find his father. His eyes accustomed to the search for the broad-shouldered man, Theo found him quickly and they exchanged stories from the morning. Theo listened carefully as his father explained that the man, Jesus, had been speaking. The great mass of people had gathered abruptly, leaving work and daily agendas to hear the famed "healer" talk about authority and judgment and the glory of God. "...and there's nothing really unique about him. That's the strange thing - everyone is drawn to him and his message, but no one exactly knows why. He talks about heaven and life and maybe we are desperate to hear about some hope. I don't know, Theo, this man is either really dangerous or.... or.... well, I don't know." Theo nodded along at his father's words as he looked at the people around him. They all stood transfixed and in hushed conversation about the "healer" and his ways. Suddenly, a small group seem to be conferring just above the crowd. Several in the group seemed agitated, but one man lifted his hands and placed them on their shoulders. He motioned out to the crowd and spoke a few more words before the men dispersed. "That's the one - the man in the center who just settled that dispute. That's Jesus," Theo's father said. Soon, the two men from the dispute were circling around the crowd and asking if anyone had any food. They walked amongst the crowd, searching (quite desperately) for someone who had food with them. Without thinking, Theo approached one of the men and opened his satchel, "I have two fish and five barley loaves." He looked up at the men and searched their eyes. A quiet burning pushed him to say again, "Did you hear? I have some fish and some barley loaves here in my satchel." Theo lifted it up for their inspection. The men nodded at one another and then, thanking Theo, swooped into his satchel and left it limp at his side. They wove back through the crowd, asking the same question, "Does anyone have any food?" Theo returned to his father who stood with an unpleasant, furrowed brow. "And now, son, what do you expect us to eat?" "Uh, I... I don't know father. I just, well, I don't know what happened. I saw they needed food and remembered I had some. I couldn't think of any reason why I shouldn't give it to them.... I...."
Before Theo could finish, the man named Jesus was holding the loaves and the fish and blessing them. Theo looked twice and a third time to make sure the man was the "healer" and that what he had in his hands were the very stinky fish he had carried in his satchel. Having confirmed these things, he began to squirm through the crowd to get a closer look. Within minutes he was at the very front, watching Jesus motion for the men to bring him the baskets. Theo realized that his food was the sole contribution to the questions from the men earlier. And now, Theo watched as the man named Jesus blessed and broke his bread and filled baskets with it. The five barley loaves seemed never to grow smaller, only breaking off into more pieces. Now, Jesus was telling the men to pass the bread around so everyone would eat and be full. Theo thought for sure the fish would be a personal meal for the healer, but it was not so. The man named Jesus took the fish next and broke it and filled baskets for the men to pass around. Theo stood incredulous as the baskets passed by him and he took from the bounty. He could have filled his whole satchel several times with what he saw in front of him. Then the basket passed with the fish and again Theo marveled at the way the food had multiplied right in front of his eyes. Even the long journey with smelly fish seemed a small thing compared to this crowd enjoying a full meal. He came only with two fish and five loaves and gave it away without knowing why. Now, he saw that all he gave was multiplied for thousands of people. Twelve baskets stacked up around the edges of the crowd because the people couldn't eat another bite! This was no ordinary day and no ordinary adventure and no ordinary healer. Theo silently declared he would be willing to give much more to a man like this. I just want you to know I disassembled an (apparently) unnecessary portion of my car with a borrowed wrench set, two multi-tools, and some expert parking over a small ditch. Dirty hands and all, I marched down the hallway to ask the owner of the borrowed wrench set if: 1. this (the one I was carrying) plastic part is necessary 2. the oily residue is important 3. I should do anything with it - like keep it or sew it back on. The laughter was too much - the whole thing was ridiculous enough to be hilarious and so I laughed until tears came out my eyes. I have very little time, but I wanted to do a little bit of creative writing. Since I am making the rules about what it means for me to write every day, I'm saying it's okay to revisit pieces from days past and expand. So, we're back to the man who skipped breakfast. Previously on "a story of a man who skipped breakfast"
He chose a table by the window, but nestled next to a book shelf filled with classics and comics - a strange combination, he thought. Without warning, the aproned girl set herself down across from the man and asked where he was walking from. That morning, the man skipped breakfast. "So, where are you walking from?" The wrinkled flannel shifted and the man brought his pale green gaze in line with the aproned girl's greys. "I started this morning from my apartment on East 52nd." It occurred to the man that this was a strange question even for typical social encounters. 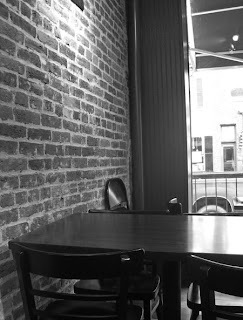 Maybe it was its oddity that kept him seated in the cafe window, next to the bookshelf filled with classics and comics. "Oh. I like your shirt," she said, "My name is Amber." "I like my shirt too," he fidgeted and let his eyes fall to the empty table. "Well, are you going to order or what?" "I think I'll choose the 'or what' option," The man said whimsically, allowing his hands to venture from their hiding places to rest on the table's top and smooth the surfaces of the placemat. "Okay, then." She said it like a the phrase of a folk song, building up to, "You know what's funny about this place?" Her eyes flitted from the flannel to the glass counters and back again, "the memories are like tippy-toes." The man chuckled through his nose and then something barely audible escaped resembling soft laughter. His shoulders relaxed a bit and he allowed himself to study the strange, aproned girl named Amber who had memories like tippy-toes. An untrained smile split his lips and he expected her to squirm beneath his stare. She didn't. She caught one of the wild wisps of her hair, twisted it in her fingers and magically hid it into the auburn mass. "Every day around 11 am, my mom would put down her pen and say, 'Well, I could use some fresh air' and just like that we were in golashes or sandals or winter boots (whatever the weather demanded or fit our fancy) and out the front door. Thirty minutes later we would show up here, at Café Sueno. My mom would also think and purse her lips together before ordering the orange cinnamon scone with English Breakfast tea. I would ponder in similar fashion and end up always with a peanut long john doughnut and a whipped-cream topped hot chocolate." The man waited for Amber to continue, picturing her and her mother sipping drinks and munching at 11:30 every day. "I was 5 years old and I waited all morning for those words, 'Well, I could use some fresh air.' When they came, it took all my five-year-old strength to not burst with excitement. So, I managed to keep my composure from the waist up (or at least I thought so), but for the entire walk my excitement seeped through to my toes and there I bounced until we'd ordered and sat down at that table right over there." Amber nodded her head toward another table right next to the window. "Tippy-toe memories." The words were lethargic and thick and sweet rolling out. The man's smile was no longer awkward, but had made a kind of home between the creases of his cheeks. He thought about the rhythm of the world for this five-year-old and almost snuggled in to the sound of it. This is day FOUR of the Every Day in May Project, where I am writing every single day creatively. Do you have an Every Day in May challenge? Today's creative writing comes by way of my friend Johanna who suggested I tell the story of a Norman Rockwell painting. I typed in Norman Rockwell, hit images, and selected the very first (which happened to be from www.rumorsdaily.com) and off I go. Little Sammy Whittendorf got as far as Eagle Run Creek before he started to get blisters on his heels. He hadn't thought about how irksome his church shoes would be on the long journey, only about how tennis shoes wouldn't do for his entrepreneurial enterprising of the great western frontier. As he leaned down to tie the brown, slippery laces for the 23rd time, he wished he had chosen Monday comfort over Sunday style. He rose again and stretched his 7-year-old frame, lifting all his possessions and investment portfolios high into the air and then letting the red bundle linger a bit before finding its place on his shoulder. Sammy peered over the single lane bridge at Eagle Run Creek and imagined he saw himself in the wrinkles of water. He didn't, of course, but he imagined a reflection of a strong, important man with a red bundle for a briefcase on his way to see about some business. Sammy quickly realized he wasn't imagining at all, but simply explaining his task for this glorious September day filled with opportunity. Enterprising was much more important than school and subtraction and Walter Leadenhower. Yes, he thought to himself, enterprising was much more important. He leaned down and picked up a rough piece of grey gravel and weighed it in his palm. With all the strength in his enterprising spirit, he thrust it out and over the bridge and watched the fast descent. A bit disappointed with the distance, Sammy concluded decidedly there was a strong easterly wind coming in which reminded him he should get moving. He was to be at Fletcher's Crossing before noon and the sun was already climbing high above his head. Sammy left the bridge forgetting about blisters, although his socks were beginning to soak and would remind him later. His sights were set on the undiscovered and (Sammy was convinced) untapped resources of the expansive plain beyond the town of Harrelsville, Iowa. Though still in the formative stages, the success of his hastily laid plans was every bit as sure as his awkward, arm-swinging stride. About five paces after crossing the bridge, Sammy heard a distant rumbling that quickly turned into a much louder roar. Gripping his red bundle, he meant to dart into the ditch for cover (many a soul could be out to steal his innovative, if not quite complete, plans), but the combination of dust and a familiar voice sent him into confusion. The voice boomed out of a dream-cloud of smoke, "Sammy? Is that you? What in tarnation are you doing out here? We been lookin' all over for you!" Everything dreamlike faded and Sammy's hopes of enterprising the great western frontier of Harrelsville with it. "Hello, Officer Patterson," kind of mumbled out of Sammy's lower, protruding lip. "You know you walked almost 2 miles from your mom and pap's house? Now, that's a long way, son." Sammy kicked at the grey gravel rocks underneath his feet, sending little dust clouds up to his chin. His red bundle had dropped and now sat beside him, a dejected pile imitated by his face. "I only wanted to enterprise the western frontier, Officer." He sputtered on, "I just thought to myself, 'what good is all these numbers if I can't go-a-enterprisin' and makin' somethin' of myself?' That's what I thought, Officer, honest!" Officer Patterson's eyebrows were knit together in one long line across his forehead and his nose jutted out under his important policeman hat. He seemed to think for a moment before he said, "You know what, Sammy?" "Well, no I don't know, Officer Patterson," Sammy answered after he judged the pause too long. "I was just wonderin' how you'd feel about some ice cream right about now. See, I've been feeling myself a little hungry for that rocky road flavor they got in new last week at the diner, what d'ya say?" "Oh boy, oh boy! Officer Patterson, I thought for sure I was going to cry, but I love ice cream and now you've done it," Sammy caught himself in mid-ice cream-excitement, before his smile covered his whole face, "But, Officer I still want to enterprise, is that okay?" "Maybe we can talk about this enterprise business with Teddy Noucomb at the diner. He's always got some good advice for... you know, enterprising, as you call it." "Hm," Sammy rubbed his sweaty palms on the newly dirtied white t-shirt he wore, "I'll think about it. You can't talk business and enterprising with just anybody, you know." "Oh, I do know. I do know," Officer Patterson said as he settled his blue hat back into place over his knitted brows and jutting-out nose. "I s'pose I'll go then," Sammy said, picking up his red bundle and walking toward Officer Patterson's cruiser. The Officer opened the passenger door and secured the truant before walking around and taking his seat on the driver's side. "I s'pose that'd be a good idea." He wore the night around his neck, next to his wrinkled flannel shirt. The pearly snaps were the only smooth surfaces in his entire ensemble, but the man would never notice. He claimed the comfortable treasure (not of the re-worked fashion vintage variety) when his father had passed away one year before and had worn the plaid pattern almost every day since. His sinister hands found the depths of his denim pockets and wrestled with the gray lint as he walked. It was morning, but the days passed without the normal measures of time. There was no work or school or duties or appointments. There was only the man, the flannel, the lint, and the very intentional walking. On this morning, the man looked up from his decisive path to see an empty café. The man quickly took note of the time, gathered it was around 8 am, and then wondered why the young aproned girl inside was sweeping around empty tables. It had been awhile since the man's thoughts wandered from the flannel, the lint, and the walking, but something about the deserted morning destination drew him inside. Fumbling for a tight grip on the lint cloud with his right hand, he pushed the café door with his left, and entered headfirst. The man couldn't form an answer when he heard the aproned girl ask, "Welcome, sir. Where would you like to sit?" He stood there, looking at the floor, and the whole mess of a solitary year rushed his mind. The conversation seemed to invite him so simply out of the self-imposed shell he crawled into after his father's passing. He drank her words like sweet honey and then managed, "I'm sorry, you said?" "I said, welcome. Would you like a table?" This time she tilted her head to the side and leaned her broom against the wall. He thought a smile pulled at the corner of her lips, but he hadn't studied a human face in so long he wasn't quite sure. He realized, as he wondered about the occasion of a smile, that the aproned girl was expecting a response to her question and he furiously rubbed the lint with his right hand and said, "Uh, yes, this one will do. Thank you." What do you think? Should I continue with this for a longer story? This is Day TWO of the Every Day in May Project. This is the first day of May. It also marks the first full day of life for Natalie Renee Nichols, born yesterday at 3 pm by natural birth to my brother and sister-in-law (Samuel and Bethany). I love her so much already and have tried to gather all I can from my brother's sporadic tweets and my mom's antics on skype. Today is also the start of a month-long endeavor, inspired by @Christinakeeps who was inspired by @frenchtoastgirl to do the thing you love every single day for the month of May. Well, there are a lot of things that I love doing... most involve laughter, some involve people, many involve words, and a few involve canvas. The one thing I chose: writing. I know, it doesn't seem that ambitious (because this is already a standing goal of mine), but I'm not just going to try to write on the blog everyday in 'dear diary' style. In fact, I don't even think I need to post every day to be legit about the challenge. I want to do a writing exercise every day, something challenging or new or personal. I'm probably going to need to look up some writing prompts so I'm not just completely random. If you have any ideas, let me know. If you are doing Every Day in May as well, DO SHARE! Okay, below is my writing for today. This is in response to two articles I recently read. The first, "Survey:72 percent evangelicals more spiritual than religious" appeared in USA Today based on research by Lifeway. The second, "Separate truths," was written by a religion professor at Boston University and appeared on Boston.com. Read the articles and then see my thoughts here in poem form. and tarries about; runs blind to the fray. of abuse and betrayal and manmade fears. disappointment, abandonment and man's wild volition. explanations attempt to determine eternal fate. and tolerant voices crowding out holidays at beaches. a rhyme or a reason to be sanctified. with an honest confession, broken and contrite. is the cross that bears my Savior's name. that restores and revives a heart once of stone. to reach through foolishness and make the faint soul alive.